Machine Moving Skates | EC & MW, Inc.
Why settle for a copy when you can have the original ! We have been using and then manufacturing our patented machine moving skates #4,088,337 since 1976. The story behind these machinery moving skates: The owner of EC&MW, Inc. at that time owning a moving and storage & rigging company, originally designed these machine moving skates for installing cancer machines in hospitals throughout the U.S.A., Canada and Puerto Rico. Just some of the obstacles, included tile floors, dock levelers as well as wheelchair ramps. Using what was available at the time wasn’t working. So with trial and error, came up with the design you still see today. This is the very first moving skate with polyurethane wheels and with locking and unlocking rocking beam design. Little change has been made original design because it works so well. What changes have been made are mostly in capacity with wheel improvements. The rocking top plate is also removable if so desired, for a lower profile. There is no other equipment moving skate like ours. Its design is one of a kind. Rocking top plate for even load disbursement up and down inclines also makes climbing deck plates and thresholds easier and lessens the risk of dolly kick outs. 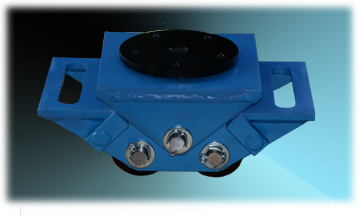 Our model BR4ST steering dolly above uses a .375″ steel circle by 6″ diameter with 5 steel grippers. It is held in place by a .50″ by 13 threaded grade 8 taper head bolt from above and a jam nut below. We use a .125″ thick Delrin® bushing for ease in turning. The Delrin® bushing has a 5,000 PSI capacity. 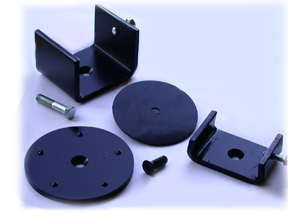 Turning plate removal can be done in minutes for fixed dolly application or for bushing replacement. With its one of a kind rocking top plate our machinery moving dolly places equal weight on all four polyurethane wheels, even when ascending or descending inclines up to 5 degrees. This design makes climbing steels plates and thresholds easier. Because of the weight displacement, it also extends the life of the wheels. When weight is distributed evenly over top, each dolly has a load capacity of 7,550 lbs. Used in a set of (4) this dolly gives you the ability to move equipment weighing up to 30,200 pounds. For machinery/equipment with smaller legs or narrow bases just flip the two locking bars and your moving dolly now has a stationary top plate. This gives you the more conventional machinery moving skate. All of our large machinery moving dollies come standard with a 1/2″ 13 threaded hole in the center of it’s 8″ square .50″ thick top plate. This allows you to bolt the dollies to the equipment for safer moving. Should you use custom moving brackets, these too can be attached. Using (4) wheels instead of just 2 large ones this makes it easier to turn. With the 95 duro rated polyurethane wheels it gives you the ability for moving over a larger variety of surfaces. We use a double sealed ball bearing system to prevent contaminants from entering the bearings for a long life. 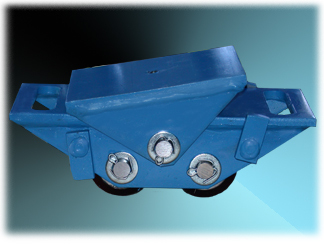 Each wheels measures 2.75″w x 3.00″ diameter with a .750″ axle. Custom brackets like the one above are also available please ask for a quote. 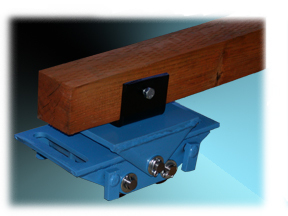 The bracket above and below show how you can attach either a 4 x 4 or 2 x 4 skid. 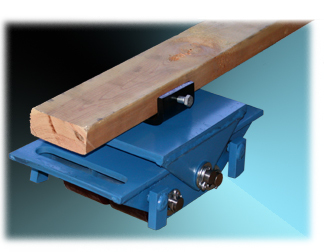 This would also work if it were a 4 inch steel box beam, shown in the movie above. This greatly reduces the chance of losing a skate by way of a kick out, especially when using skates in sets of four or more. As you can see, custom brackets are virtually limitless. We also manufacture the above skate/s without the locking bars such as our BR4FXNB. They are designed for moving larger footprint items that can afford to have the rocking plate move. If you are moving equipment with smaller footprints then our standard models with the locking bars would be more suitable. All of our “NB” 4 wheel models carry the same load capacities and same great features as our standard models again with the exception of the locking bars. Capacity Per dolly @ 2 mph.